Last week, I was made an offer I couldn’t refuse. I was invited to try out ScoreBig.com , an online ticketing platform that has been around for a couple years but was new to me. I was offered credit to the site in exchange for a blog post. Credit that could be used towards Red Sox tickets. Credit that ultimately got me FREE Red Sox tickets. Count me in. I’ll be completely honest, there were a few times when I thought about not using the credit and not blogging about the website because I was frustrated. But in the end, I wanted to be able to give a review of this service if it could be a viable resource for discounted tickets. And I wanted to go to a Red Sox game, lets be real. ScoreBig moves unsold ticket inventory to sports games, concerts, theater, and other attractions. In the Boston area, most of the listings are for Sox games but there are some big name concerts on there as well (Beyonce, for instance. I thought about it, trust me.) There are no fees and ticket delivery (whether electronic or by mail) is free. Here’s how it works: You choose an event, choose the seating area you’d like, then make an offer for how much you want to pay for those seats. You get an answer instantly whether your offer was accepted or not. If not, you can accept their counter offer or try again on that seating area in 24 hours. As I mentioned, I got frustrated a couple times. The first was some mix up with login information that seems to have been resolved. The site would say I was logged in when I wasn’t, and would ask me for my login information multiple times. Maybe it says something about my patience level when I was ready to walk away just from that, but there you have it. A call to customer service (A very polite human! Right away! No number pushing! Thanks Daniel…or David….D-Man!) got me on the right track. I’ve been to two COLD Sox games this season, so I chose a date in July when temperatures might actually be above 60. Then I chose the “Two-Star Seating Area”. For those of you Fenway Faithful, this gets you anywhere in the Grandstand or Right Field Boxes. Here’s where things get a bit hinky for me. On the ScoreBig.com , there’s a listed “Full Price” of $66.16 per ticket. However, if you go onto the Red Sox website, the price listed for these seating areas at the same game is $52. 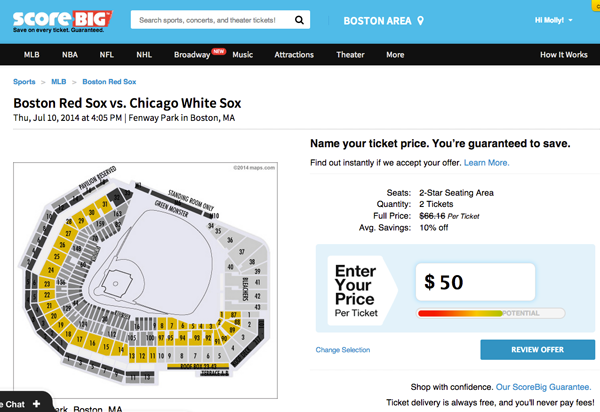 With convenience and processing fees, the total per e-ticket you’d pay on RedSox.com is $60. I assume there’s a delivery fee if having the tickets sent in the mail but getting them electronically is a free option. At the bottom of the ScoreBig page it states “Full Price is the max value of the ticket plus service and delivery fees.” Where they got $66.16 is a bit of a mystery and I find it misleading. If you didn’t do the research and just assumed that full price was correct, you feel like you’re getting a bigger deal than you are. Not knowing the real “full price” of the tickets, I put in an offer of $50 per, which was accepted. But how do I know I couldn’t have gotten them for cheaper had I tried? I don’t. Because of the lack of transparency (which protects the ticket sellers, understandably), you never really know what their bottom line is. This leads to some back and forth and fiddling when all you really want to do is buy the darn tickets already. Checking other ticket vendors made me feel a bit better about the price difference. Tickets for the same area for the same game were being sold for $62.50 and $68 on Ace Ticket and Stub Hub respectively. If I had just these three options ahead of me, the fiddling with offers indeed saved me money making ScoreBig a slight headache but maybe a worthy headache if you do your research. I made my offer and received a confirmation for the tickets on June 1. I was informed that I would be receiveing e-tickets. As yesterday, June 4, and I hadn’t received an email with the tickets yet and on my account it still said “processing.” Since I used my credit for these, I wasn’t worried but if I had used Real Life Money I would’ve been freaking out that it was gone. I sent an email to their help address and within minutes, the e-tickets were in my email inbox. I don’t know why it took an extra email to get them. New members save $10 on first order of sports, concert and theater tickets with code HELLO10! 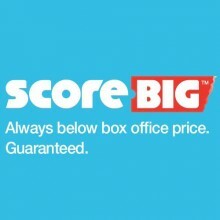 ScoreBig.com, where you can save up to 60% on tickets nationwide! Purchase must be $30 or more.